When the New York Metropolitan Transit Authority and the designers of the South Street Seaport demand ekki, they initiate a process that not only leads to tropical deforestation but also kills chimpanzees. Loggers gouge open the old growth forests of Africa to extract the ekki trees and, in the process, ignite savage chimp wars in which four out of every five chimps die, according to Dr. White, a field biologist for the Wildlife Conservation Society. 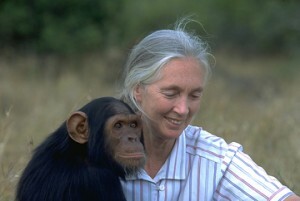 Dr. White says that chimps are petrified of both humans and the big, noisy machines of large-scale logging operations. As a result, they flee—right into the territory of the next chimp community. The males from the invaded community attack the refugees, and many die. As the loggers continue to advance, the invaded community itself becomes displaced and new warfare breaks out. Next, a small army of professional hunters follow the network of bulldozed roads created by logging operations. Along the way, the hunters kill large quantities of chimps and monkeys, antelopes and anteaters, and sell them as “bushmeat,” a high-priced, luxury fare in various urban areas. 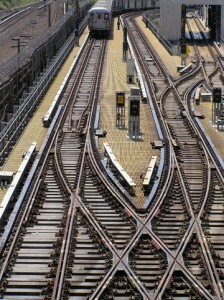 The Metropolitan Transit Authority, a state agency, uses ekki for subway track ties. It’s a decade after CTA’s visionary design. The science is in. Please urge Executive Officer Elliot G. Sander and the MTA to do the right thing for the nation’s most renowned transportation system and for the peoples and chimps of West African rainforests. In 1985, the City of New York built the decking of the South Street Seaport with ekki. Just 25 years since this installation, the ekki has withered. 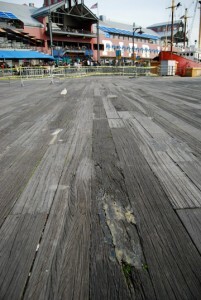 The epoxy used to patch it up makes the pier look as if it was spattered with industrial kitchen sludge. Don’t tell us that recycled plastic lumber wouldn’t look better! And it would last a heck of a lot longer, too—over 100 years. General Growth Properties and the City are currently re-designing the pier and, unless we can get them to do the right thing, they’re going to order a massive amount of rainforest wood to replace the decking.